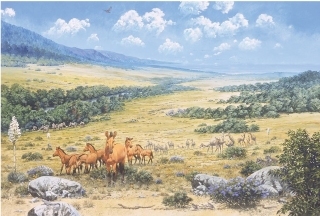 Paleolandscape artwork by John Francis, from "Fossil Treasures of the Anza-Borrego Desert"
Earth's climate is primarily determined by the amount of solar radiation it receives, and the distribution of that energy over the surface of the planet. It has long been observed that the variations in received sunshine are cyclical in nature, most obviously the annual cycle of the seasons. With the development of modern astronomy, the relationship of climate to the axial tilt of the earth and the orbital motions of the solar system became apparent. Milutin Milankovich, a Serbian engineer, worked out a mathematical model for the gravitational interactions among the Sun, Earth, Moon, Jupiter and Venus, which revealed several cycles with periods up to 100,000 years. Although many solar and terrestrial modifiers may dampen or amplify these orbital effects, the "Milankovich cycles" are the basis of climate and climate change. Because plant and animal communities generally thrive in only a limited range of habitats, the fossil record of Anza-Borrego provides a broad perspective on how habitats - and thus the prevailing climates - have changed during the time that the sediments of the region were being deposited. 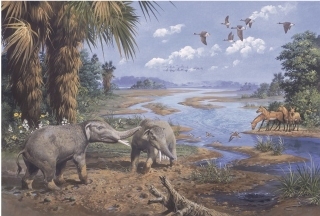 The marine environment of the later Miocene, beginning around 7 million years ago and preserved in the Imperial Group of sediments, was warm and tropical. Anza-Borrego marine life at this time was part of the Tertiary Caribbean Province, which also included the Caribbean sea, the western Gulf of Mexico and the equatorial eastern Pacific. Many of the fossil clams, snails and corals found here have affinities with fossil and modern Caribbean species. 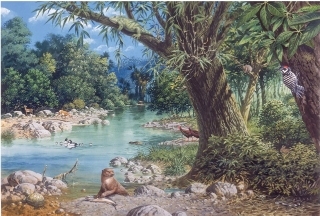 At the very end of the Miocene, at around 5 million years ago, this tropical picture began to change. The rapid deposition of Colorado River Delta sediments on top of the older marine sandstones and claystones speaks of a period of increased precipitation in southwestern North America. Globally, marine regression accompanying expansion of the Antarctic ice sheet in the latest Miocene suggests cooling at high and middle latitudes, although the earliest Pliocene appears to have been a period of warming temperatures. 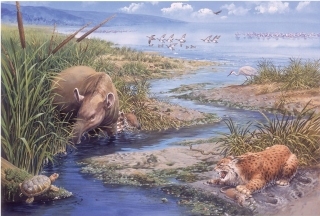 By the early to middle Pliocene (4.0 to 2.6 million years ago) the Anza-Borrego region had transformed into a floodplain near sea level, with a moderate four-season climate, annual rainfall of 15-25 inches and temperatures ranging from 15 to 80 degrees Fahrenheit. The presence of fossil hardwoods typical of a temperate woodland community, as well as terrestrial deltaic sediments suggest [A1] a setting of lakes, ponds and streams during this period. But the climate changed from the late Miocene through the close of the Pleistocene age, probably altering many times but becoming ultimately increasingly arid. 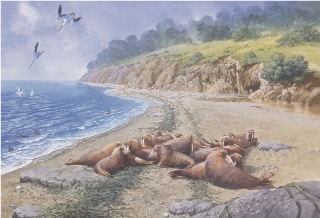 Paleontologic evidence for this climate shift is found in the fossil record of the mammalian megafauna, particularly the camels and the sloths, whose evolution suggests adaptation to the emergence of open grassland and savannah habitat, a warmer, drier environment. Anza-Borrego's more than 3800 identified small reptile and mammal fossils include a variety of both warm-adapted and cool-adapted taxa. Some of these forms are found in the same strata, which makes it difficult to draw detailed conclusions about paleoclimates. However, certain trends do emerge. Animals with neo-tropical affinities are generally older than those with hol-arctic affinities. [A1]The turtles and birds come from later deposits but are assumed to have been in the area earlier. ​While it is possible to monitor in great detail most of the parameters of our current weather and climate (temperature, precipitation, barometric pressure, etc.) , it is basically impossible to measure directly any of these variables for time past. But with modern physical and chemical methods, the residual evidence left in rocks and fossils can be analyzed, providing results that can be precisely correlated with some specific climatic variables. These residual signals are called "proxies." They can function as stand-ins for the variables we can't directly measure. Examples of useful climate proxies include the stable isotopes of oxygen and carbon. These are naturally-occurring, nonradioactive forms of the atoms that are found in water and the carbon-containing compounds that form much of the bulk of plant and animal bodies. The relative proportion of an isotope to the more common form of its parent element may vary depending on climatic conditions. For instance, the proportion of oxygen 18 to oxygen 16 in rainwater is very sensitive to mean annual temperature and the amount of evaporation relative to precipitation. This is the drinking water for a living animal, and goes directly into the formation of its teeth and bones. Since tooth enamel, once formed, is quite stable chemically under environmental conditions, the proportion of oxygen 18 to oxygen 16 in a fossil tooth is an accurate representation of the animal's drinking water, a good proxy for temperature and the ratio of evaporation to precipitation. Carbon isotope ratios, by a more complex pathway, turn out to be good proxies for the vegetation types in an animal's diet, and correlate with the temperature and water economy in which the plants grew. Recently, a study of the carbon and oxygen isotope ratios in 28 fossil horse teeth from Anza-Borrego yielded valuable information about the climate of the region during the late Pliocene and Plio-Pleistocene boundary periods (Brogenski,2001). The early paleontologists who collected many of these fossil horse teeth could not possibly have foreseen the intricacies of stable isotope mass spectrometry or the wealth of environmental information locked within the tooth fragments. Who can say what tools will be available to researchers ten or fifty years in the future, or what they may learn from the bones and teeth of long-dead creatures that roamed this region in the distant past.